Michael Schillmeier’s work combines process-oriented Sociology, Science and Technology Studies (STS) and Empirical Philosophy. He graduated at the LMU Munich/Germany and received his PhD from Lancaster University. He held a Schumpeter-Fellowship (VolkswagenStiftung) to research ‘Innovations in Nano-Medicine’ in Germany and the UK (2010-2015). Main focus of this project is to analyse and engage with the emergence of nanomedical knowledge practices, objects and technologies. 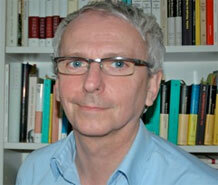 He is co-editor of Space & Culture and member of the editorial board of The Sociologcial Review. His empirical and conceptual work is concerned with the becoming of social relations, actors, practices and concerns whereby the 'non-normal', 'unexpected', 'uncommon', or 'unknown' plays a central part. Linking social sciences, philosophy and art he has widely written on the material dynamics and heterogeneity of societal orderings and change. Research topics include STS, dis/abling practices, care practices, health & illness, human/non-human relations, cosmopolitics. In my research I focus on ways of rethinking the social as eventful relations between humans as well as humans and nonhumans. In particular, my work aims to allow novel ways of sociological thought, social research and socio-political intervention. Both my theoretical and empirical work is outlining a caring sociology which is concerned with the complexities of cosmopolitics, i.e. the disruption, questionability and alteration of the normal and taken for granted by the unexpected and unknown. Over the years, I have made a sustained contribution to cross-disciplinary and international research that brings together science, philosophy and art. I have been intensively written on dis/abling processes, science, medicine & technology, well-being & practices of caring, contagion and illness, non/human agency, materiality and objects, sensory practices and affective relations. My latest book Eventful Bodies – The Cosmopolitics of Illness discusses the experiences of illness and how social relations are reshaped and reordered. Reflecting the everyday lives of people with visual disablities, my book Rethinking Disability – Bodies Senses and Things (Routledge, 2012) offers a novel reading of dis/ability and how everyday practices question and re/configure social normalcy. With Eleoma Joshua (Edinburgh) I edited Disability in German Literature, Film and Theatre (Camden House, NY, 2010). With Joanna Latimer (Cardiff) I published Un/Knowing Bodies (Sociologocal Review Monograph Series, Wiley-Blackwell, 2009), where we explore the body and embodiment in relation to the making and unmaking of social worlds. In collaboration with Miquel Domènech (UABarcelona) I edited New Technologies and Emerging Spaces of Care (Ashgate, 2010). We analyse the social and cultural impact of new technologies on health care practices and systems. With Jan-Hendrik Passoth and Birgit Peuker, we brought together leading scholars in STS (Latour, Law, Michael, Munro etc.) to discuss Agency without Actors? by introducing ‘New Approaches to Collective Action’ (Routledge, 2012). Most recently, I have published a two volume Special Focus Issue Quo Vadis Nanomedicine for the International Journal Nanomedicine. Together with scientists, philosophers and clinicans I explore the history and possible future of novel nanobiomedical reserach practices. In my paper Caring about Social Complexity in Nanomedicine I outlines a three-folded concept of public engagement with science and the emerging technologies in health care. Between 2010-2015 I held a Schumpeter Fellowship which was funded by the German VolkswagenStiftung to explore 'Innovations in Nanomedicine' and related processes of scientific knowledge and object formation.